Discworld Emporium • View topic - Anyone like old maps? It dates from 8,500-9,500 years ago! Re: Anyone like old maps? That's actually really Quite Interesting Are you researching more questions or have you taken up archaeology, specialising in ancient Turkey?
. . . although, having just re-read Thud! it reminds me of Methodia Rascal's chicken sitting on a load of the dwarfs' Devices . . . Awk! It certainly shows which houses have more than one bedroom. Grace Speaker wrote: That's actually really Quite Interesting Are you researching more questions or have you taken up archaeology, specialising in ancient Turkey? Grace Speaker wrote: ...have you taken up archaeology, specialising in ancient Turkey? Nice map though, fascinating. Of course they have not yet uncovered the writing that says "Enjoy your visit to the Ancient town of Çatalhöyük, copies of this map are available in the gift shop. The management takes no responsibility for sudden searing volcanic death during the course of your stay. Have a nice day!" We'll keep the turtle moving. 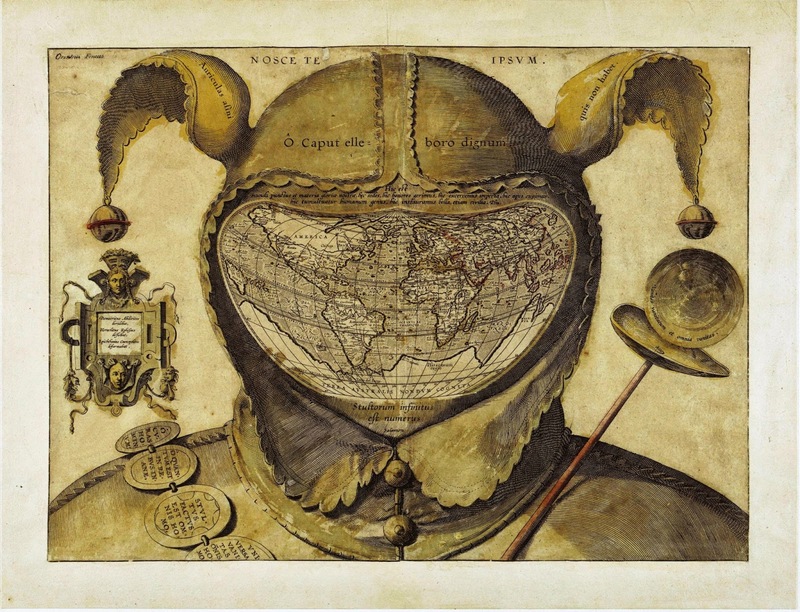 Very possibly the scariest map you'll every see : The Fool's Cap Map of the World dates from ca. 1580-1590 and is one of the big mysteries in the history of cartography. It is unknown why, when and by whom the map was made . . . .
. . . . anyone care to advance a theory? This one isn't as old, it's "only" from 1636. But I think it's suitable for the forum as it shows Gladhammer's* mine. I think that's a perfect dwarf name! *OK, so Gladhammar is a village in Sweden. But it could have been in the Ramtops. Very fun! All three are interesting. The last one looks like the houses have tipped over. A map for romantics, perhaps? I don't think Euclid would approve though . . .
Really? Unintentional prescience on my part! I hope that bit makes it into the show! Was it a good show & who was on the panel? Well if you're not allowed to say, then I absolutely won't be looking forward to seeing Mr Addison, Ms Perkiins and maybe Prof Cox? Ah well, to quote Jim Steinman, "two outta three ain't bad"
Well if you're not allowed to say, then I absolutely won't be looking forward to seeing Mr Addison, Ms Perkins and maybe Prof Cox? Do you not count Sue Perkins as a lady then? If it wasn't Sue, was it Mel? Not, you understand, that I am incorrigibly nosey and am asking you to either confirm or deny who the guests were . . .